While infecting humans and other mammals, Leishmania spp. are obligate intracellular parasites. 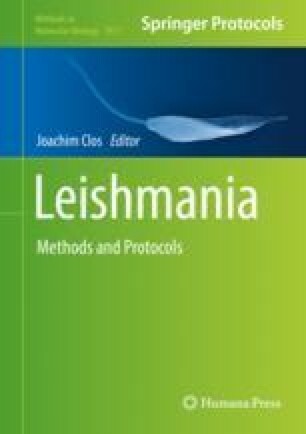 Therefore, for the purpose of therapeutic intervention and the study of infectivity, the relevant form of Leishmania spp. is the intracellular amastigote. Therefore, monitoring intracellular parasite load is an essential requirement in many fields of Leishmania research. Real-time quantitative PCR is a highly accurate technique for the detection and quantification of parasite burden in in vitro or in vivo infection experiments. The quantification of DNA for standard curves shows linearity over a 5 to 6-log concentration range indicating the high sensitivity of the method. Moreover, qPCR allows for the simultaneous quantification of host and parasite DNA in the same reaction, thereby allowing for an assessment of relative parasite load for basic research, but also for low- to medium-throughput compound screening. The method also allows to analyze late stages of in vitro infections where host cells and parasites have detached from surfaces and escape microscopy-based assays. Thanks to Heidrun Von Thien for the advice and help with the establishment of the real-time qPCR assay.